The big and bright waning gibbous moon shines in front of Gemini the Twins tonight. Our chart today shows you the view toward the east-northeast sky about three hours after sunset. Gemini’s two brightest stars are Castor and Pollux. They shine quite close to the moon tonight. The moon and Gemini swing westward throughout the night, for the same reason the sun moves westward during the day. It is because the Earth rotates eastward on its axis. Therefore, all the heavenly bodies – the sun, moon, planets and stars – appear to travel westward across the sky. 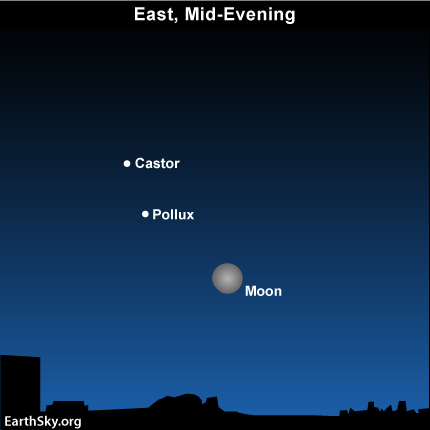 The moon, Castor and Pollux climb high overhead after midnight, and stand tall in the west at morning dawn. According to Greek sky lore, Castor and Pollux were twin brothers, born from Leda, their mortal mother, and sired by Zeus, the immortal god. Though the brothers were united in spirit, they were divided by circumstance. Castor, the mortal, was slain in battle, leaving his immortal brother inconsolable with grief. Pollux asked Zeus to release him from immortality, so he could join his brother in the great beyond. 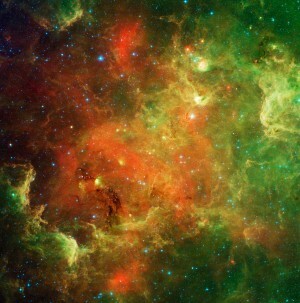 Today, the Gemini Twins stand together in the heavens, a testament to the redemptive power of brotherly love. What’s the bright object up before dawn in December? Site contents copyright © 2019 Recorder Online	except as noted. All rights reserved. | 88 queries in 2.247 seconds.